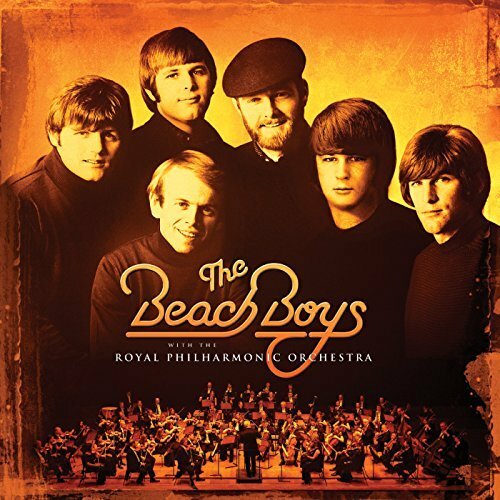 A number of folks have asked Yours Truly KJS and elobeatlesforever (elobf) to take a belated look at The Beach Boys new collaboration with The Royal Philharmonic Orchestra. Recently released on Friday 8th June and having already entered the Official UK Albums Chart at a healthy #2, this is an album that very much follows in the footsteps of Roy Orbison's equally successful 2017 outing "A Love So Beautiful". In theory, adding sweeping orchestra arrangements to the early Beach Boys classics doesn't immediately spring to mind as the most obvious of musical marriages yet the funny thing about this seventeen song album is that it seems to do just that, perhaps more so than with the slower ballads and less well known songs also on show here. For this writer, the first octet of tracks from opening overture "California Suite" through to "Heroes and Villains" offer a new depth to the Beach Boys songs that we all know and love not forgetting the closing trio of "Help Me Rhonda", "You Still Believe In Me" and "Good Vibrations". Casual Beach Boys admirers may find themselves skipping the unfamiliar and lower tempo tunes here where the new backing is less striking but on the whole there is a nice balance to what is an enjoyable record. You can also hear what inspired Roy Wood and Wizzard here too in places. Fave moments? For me, it has to be everything from "California Girls" to "Sloop John B" (which really works for me) plus, as ever, the magnificent "Good Vibrations". elobeatlesforever (elobf) recommends "The Beach Boys with The Royal Philharmonic Orchestra" to those enlightened folks who enjoy the music of ELO, Jeff Lynne, Roy Wood, The Move, The Idle Race, 'Brum Beat', The Beatles and related artistes. With thanx to Shaz Kuiama for the nudge!